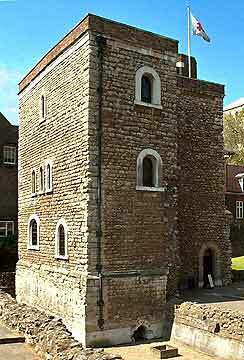 The Jewel Tower, located at the south-west corner of Old Palace Yard, was built by Henry Yevele between 1365 and 66. It was originally built to house the king's private treasure, in particular the Crown Jewels which are now stored in the Tower of London. It was subsequently used to store parliamentary records, and between 1869 and 1938 British weights and measures were tested here. The Tower was for centuries concealed behind private domestic buildings, and was brought to view only in the 20th Century.